Looking for flag poles for sale? Displaying the stars and stripes for all to see can be a significant financial investment, but not when you choose to act on your patriotism with a friend. 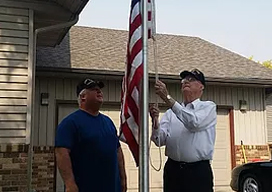 ND Flag Pole Guy proudly presents our buddy program, the number one way for you to save money while installing a flag pole! Join a friend and enjoy the savings on flag pole installation. When you and a friend buy together, we discount our installation prices for each of you. As long as the two properties are within a 20-mile radius of one another, we would be happy to save you some money for your residential flag poles. We are proud to be American, and we know you are too. Take advantage of this incredible deal and bring both patriotism and friendship to the foreground of your home or business. At ND Flag Pole Guy, we respect and cherish the beauty of our great country. From the purple mountains majesty to the amber waves of grain, you can display your pride with a made-in-America American flag. 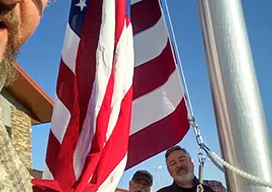 We install and service all flags, and we also handle flag pole repair if anything goes wrong. Contact us today with any questions or requests.